Constipation is a common complaint in clinical practice and usually refers to difficult, infrequent or incomplete evacuation or a change in bowel habits where a person evacuates less often than is usual for him. Constipation is difficult to define precisely due to the wide range of normal bowel habits. Many constipated patients have a normal frequency of defecation but subjective complaints of straining, hard stools and incomplete bowel evacuation. Constipation can be more than just a nuisance and aside from the more common symptoms of feeling bloated, uncomfortable and lethargic, some sufferer's associate constipation with headache, backache and skin complaints. 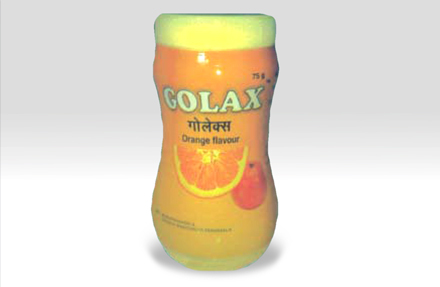 GOLAX™ Powder is a combination of Isapgol Husk, principally used as the soluble fiber source for laxatives; Senna contains hydroxyanthracene glycosides known as sennosides. These glycosides stimulate the colon activity and thus have a laxative effect. Also, these glycosides increase fluid secretion by the colon, with the effect of softening the stool and increasing its bulk. The principal constituents of Haritaki contain chebulinic acid and corilagin. It acts as a laxative and helps in the smooth evacuation and regular bowel movements and, therefore, is used for the treatment of constipation. Svarnapatri Extract (Cassia angustifolia Vahi)...............138.46 mg. In constipation, incomplete bowel evacuation, hemorrhoids, irritable bowel syndrome & diverticulitis.